Art-making seems to run in this 6th generation Minnesota family. Visual artist Seitu Jones and his granddaughter Hunter Powell talk to us about their relationship and the inspiration behind their work. Art-making seems to run in this 6th generation Minnesota family. Visual artist Seitu Jones and his granddaughter Hunter Powell talk to us about their relationship and the inspiration behind their work. This segment aired as part of MN Original show #201. Artist Bio: Seitu Jones The former artist in residence for the city of Minneapolis, works with everything from wood, clay, glass and steel. In addition to his large scale public works, Jones has exhibited at the Walker Art Center, the Minneapolis Institute of Arts, the American Craft Museum in New York, and the Institute of Contemporary Art in Philadelphia. Most recently his work has focused on the blending art with nature in a verity of mediums which include collared green pottery and designs for public drinking fountains. Artist Bio: Hunter Powell The recent Perpich Center for Arts Education graduate comes from a long history of artists, including Public Art and scenic designer, Seitu Jones. But Powell has also started to make a name for herself in the field of printmaking. Blending photos and text her screen prints explore pattern, texture and history. A 2010 Minneapolis Scholastic Art Merit Award winner Powell plans to attend The School of Visual Arts next year in New York City. 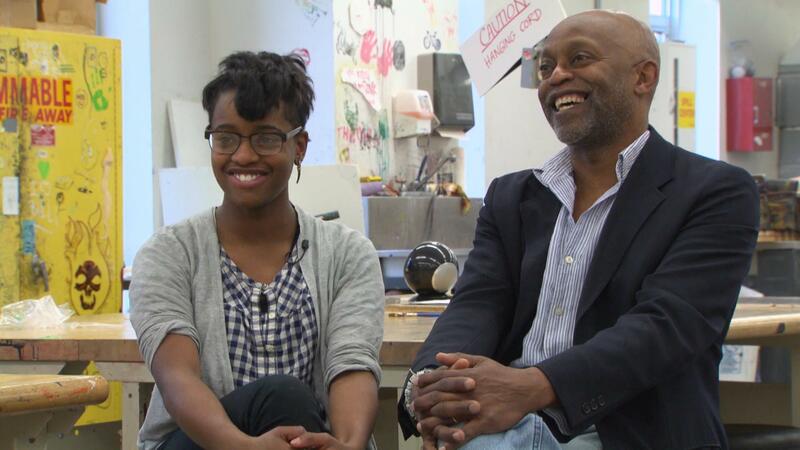 Visual artist Seitu Jones and his granddaughter Hunter Powell keep art in the family.